Our commercial-grade heating and ventilation equipment will help you dry an area, keep the air flowing, and extract water from your job-site. This contractor quality 110V heater is designed for professional use. 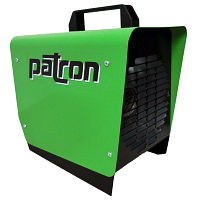 Due to popular demand we have recently brought in a batch of Patron-brand 110 V construction heaters. Features thermostatic control; and single unit heats up to 200 square feet. Standard 220 V construction heater. Simple and effective, our Westcan 220 V construction heaters feature thermostatic control and high-output fans. Plugs into a standard dryer outlet. Propane is available for purchase at Sharecost. A variety of sizes are available: 20 LB, 40 LB, 60 LB, and 100 LB. Please call ahead for availability. Use for air from -30F to 150F only. These Heavy Duty drum fans move large amounts of air at higher velocities. Polyethylene housing withstands rugged site impact easily. Perfect for any industrial, commercial or agricultural facility. Narrow fan profile with ergonomic pull handle and integrated base assembly handles. This exceptional fan/exhaust unit is used for bringing clean air via ducting into a workspace OR pushing dirty air out via ducting (ducting unit extra cost). Unit is reversible either way! Blower generates 2518 cfm through 12” opening. Stackable up to 3 high on the jobsite for more capacity.